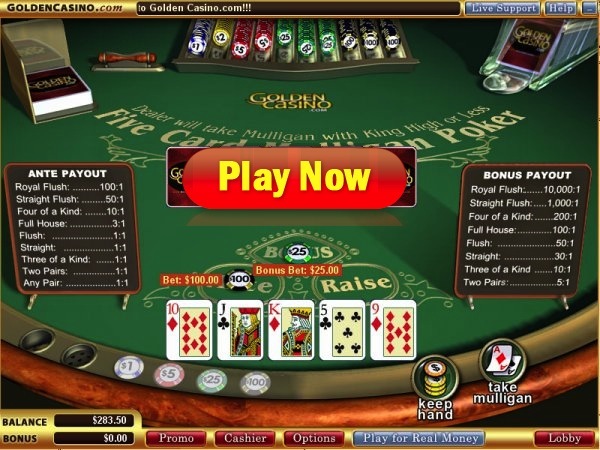 Shuffle Master is a well known company that has invented over a dozen very popular casino poker games and here’s one addition to that list – Mulligan Poker. It’s a game that is somewhat similar to Three Card Poker, but uses 5 cards and offers quite an exciting feature allowing you to get another hand dealt, if you don’t like the initial one. The game is played with a standard deck of 52 cards and hands are valued according to poker hand rankings, with the best, highest combination possible being the Royal Flush. I haven’t really seen all that many articles about this game, nor casinos that would heavily advertise it. Yet, when I asked a couple of players that I know, they all knew how to play this game, so it’s time for you to learn it too! I already mentioned that the game is dealt using a standard deck of 52 cards. Before you’ll get to playing, you have to make the so called ”ante bet”. Depending on what casino you choose to play it at, you’ll be able to wager anywhere between $1 to $500. * There also is a side bonus bet, which awards additional payout, based on the strength of your hand. B) Taking the Mulligan – a completely new hand is dealt. This will require you to put up an additional wager equal to the ”ante” bet. Note that if you choose this option, any sidebets made will be forfeited. If dealer has Ace High or a better combination (one pair+), he will stand. If dealer has King High or a worse combination, he will take the Mulligan and a new hand will be dealt to him. Dealer has a better hand – you lose all your wagers, except for the bonus payout. You have a better hand – you win a payout according to the general pay-table shown below. Both parties hold equal hands – all bets are pushed, except for the bonus. If you’ve qualified for a payout, it will be awarded, otherwise you’ve lost. There are two payout charts in the game – one for the regular play and an additional one for the bonus sidebet. Remember: If you take Mulligan and exchange your cards, your bonus bet is forfeited right away. There’s a simple optimal strategy that should be applied, when you play Mulligan Poker. Always stand when your hand is at least AK954 or a better combination. Thus, always take the Mulligan when your hand is AK953 or worse! Ready to spend a couple of great hours playing this game online? I sure hope so! Guts Casino will warmly welcome you with a $300 bonus plus 100 Free Spins. Players are also welcome to play for fun! CLICK HERE to Join Guts Casino Now!